Yesterday, we showcased the poetry of Galaktion Tabidze. Today we take a look at the works of his cousin, Titsian Tabidze, a famous Georgian symbolist poet, born on March 21, 1895. After getting education at the University of Moscow, he returned to Georgia and became one of the cofounders of the Blue Horns. 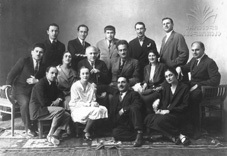 Blue Horns was a group of Georgian symbolist poets and prose-writers. They were established in 1915 in Kutaisi and were active during the 1920, but, starting from the early 30s, Soviet regime deemed the group tasteless and useless and started suppressing the members and their ideas. He fell victim to Joseph Stalin’s Great Purge in 1937, he was arrested, tortured and eventually executed on fabricated charges of treason. Known for always wearing a red carnation flower on his suits, Tabidze combined European and Oriental trends into eclectic poetry, which leaned towards Futurism and Dadaism, while also paying tribute to the classics of Georgian literature. “Those who appreciate words that provoke as well as soothe will find in Titsian qualities unmatched by his more famous cousin [referring to Galaktion Tabidze]. Titsian's political conscience gives his poetry a force absent from other Soviet poetry written during the 1920's and 1930's. In his ability combine classical aesthetics with a critique of power, he stands alone.” – writes Rebecca Gould, the translator of the poems presented. This poem walks with my life. when the apple blossoms bloomed. Tears stream from my eyes. These tears tell me I will die. I ask only that my words remain. who dwelled by the river's edge. tortured him until he died. he gave to his poems. make a bridge on Mt. Elbrus. the giant who fought Prometheus. from a lovely Circassian women. the Black Sea soaks the earth. Elbrus stands, an ancient guard. and melts in my body beneath the sun. make a bridge on Elbrus. My heart is buried here. Our wings will stay the storm. and wait for time to come. where the wind blows both ways. One name made us twins. Poems follow us like a river's current. written in these same double lines. Our ears were inscribed with these same sounds. my village, where the wind blows both ways. The laurel wreath blinded you in childhood. We sing together with the toad's heavenly orchestra. Now the hungry wolves roar in their pits. The mud is as deep as dinosaur graves. Our spades and sickles are rusty with disuse. Someone took the bell from the tower. of bread, blessed by their tears. floods my heart like a sea. gleam beyond the shattered firmament. My demon chases me over the steep abyss. Mountains spread like a giant's muscles. iron chain he will bind to my neck. and I know it serves me right. My dear, I am no lover of empty words. I am no bragger of suicide. into an emptiness of endless ravines. my other lovers burn your jealousy. who battled our tiger that dreadful night. My soul teems with your grief. My body floods with your tears. I crossed Dagestan. I saw Gunib. I, an infidel, now a shahid. though it may kill me. The sky drowns the mountains in snow. The peaks stand tall as a guillotine. the wind will utter its vengeful tones. I see the ghost of a nest, ravaged by eagles. My eyes recall my shame. How did they embalm these cliffs? Why did they exterminate this sky? Georgia, this mountain's grief belongs to you. I pity my gangrened Georgian flesh. Those who gave their lives are safe in paradise. my Georgian brothers, memory has no mercy. Shamil prays for his men. You sold us into slavery, you spoiled the battle. The night won't weep for cowards under a foreign sky. I never pulled the fatal trigger. I never donned the fighter's armor. But this battle moves even me to ecstasy. I don't want to be a poet drunk on blood. Let this day be my penitence. Let my poems wash away your treachery.